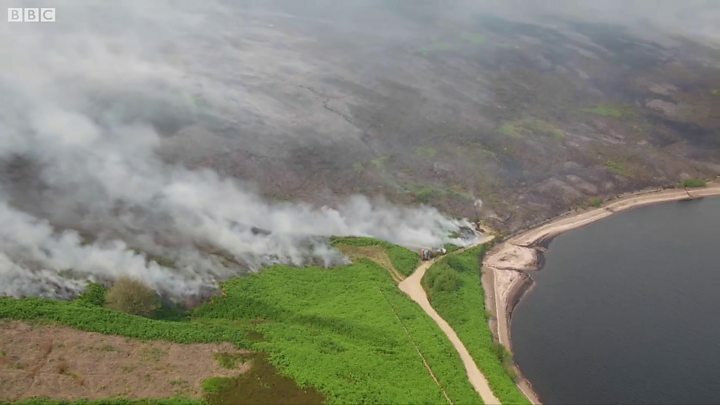 A huge moorland fire is continuing to spread because the land is "as dry as a tinder box" and winds are fanning the flames. The blaze covers 3.7miles (6km) of Saddleworth Moor and has been raging since Sunday night. More than 50 homes were evacuated in Carrbrook, near Stalybridge, Greater Manchester, and 150 people affected. One resident described seeing "ash falling like rain" and another said it "looked like the apocalypse". Dave Keelan, director of emergency response at Greater Manchester Fire and Rescue Service, said 70 of its firefighters were tackling the blaze. He confirmed talks were ongoing to see if the Army could offer extra teams, four-wheel drive vehicles and air support. Brenda Warrington, leader of Tameside Council, said firefighters were hoping for a "really good downpour" and rain was "the only thing" that would quickly deal with the blaze. "We do need mother nature to help us quite frankly," she said. "It's as dry as a tinder box up there. A lot of winds are fanning the fire." How do you tackle a moorland blaze? Mr Keelan said there were four different areas of fire embedded within peat, which is "extremely difficult" for crews to extinguish. "They are working extremely hard, as they have been for the past couple of days, in really arduous conditions in heat and smoke," he said. 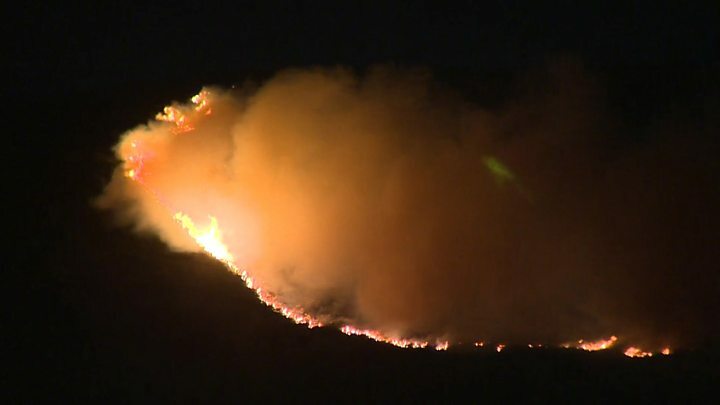 Matt Lomas, 76, who was evacuated with his wife, daughter and eight-month-old granddaughter Isla, said: "We could see flames 50ft high like a raging ball of fire all on the hill side. "It was really scary, we were really worried the smoke would hurt Isla so we had to get out." Angela Brown, 59, said she saw "ash falling like rain" from the raging fire. "It was terrifying. It was getting closer and closer. Every so often there was a crackle and flames would shoot in the air." Pete Woodward, 43, said: "It looked like the apocalypse. There was a towering inferno of flames." He said he "just grabbed a toothbrush and underpants" and got out with his partner and two young daughters. "The flames were 500 metres long, it was a raging wildfire. You could hear the odd explosion but thankfully the house survived." Police said the homes in Carr Rise, Carr Lane and Calico Crescent were evacuated on Tuesday evening due to the proximity of the flames. The majority of people had returned by Wednesday afternoon. Greater Manchester Mayor Andy Burnham said a "request to the military for extra support" is being prepared "so there is a back-up plan" to support firefighters. "I think everybody feels a great deal of gratitude towards them [firefighters] but it's hit the point where reinforcements are needed and that's what we're arranging," he told BBC Radio 5 live. Jonathan Reynolds, MP for Stalybridge and Hyde, added: "We haven't had anything of this scale in living memory, never had to evacuate people or close schools." Media captionSaddleworth Moor resident: "You could hardly breathe and your eyes were burning"
Thick smoke is swirling around the village of Carrbrook, making people cough and cover their mouths. Ash covers a welcome mat at one house, and evacuated neighbours hug each other in the street. Some have tears in their eyes while others shake their heads as the look at the charred hillside. One or two cuddle their precious pet cats and dogs. Thick smoke can still be seen on the hilltops from the fires burning on the moors beyond. Snuggled up to his mother, seven-year-old Oscar McFie sums up the mood: "It was scary, but we're safe." The fire service earlier confirmed the blaze was spreading and said crews had recommenced "offensive firefighting". Assistant Chief Fire Officer Leon Parkes said crews planned to "put a heavy attack" on the fire, which has been declared a "major incident". Greater Manchester Police's Saddleworth division said about 2,000 acres of moorland had been destroyed in the fire. Some 65,000 gallons of water were dropped on the blaze by a helicopter on Tuesday to fight the fire which was "unprecedented in recent times", it added. Firefighter Ricky Case, who has been out on the hills, said: "It's just the sheer vastness of it. It's one of the biggest ones I've been on in a long time." Farmer Chris Keytes, 58, and his wife Jane, 50, refused to leave despite the fire being just 30ft from his farm and police asking them to go. "I was concerned [but] we're set up with masks and we put a towel under the door," Mr Keytes said. "We've had fires before but this one was pretty close." Prime Minister Theresa May and Labour leader Jeremy Corbyn praised firefighters ahead of Prime Minster's Questions earlier. Mrs May told MPs the government is keeping the situation "under constant review". She offered her sympathy to the firefighters and residents and added that "operational policy arrangements" were in place "to provide support if required". Mr Corbyn said: "I'm sure all our thoughts are with the firefighters and the communities and families and the member for Stalybridge and Hyde is there today to support them." Huge amounts of smoke has drifted westwards, with large parts of Greater Manchester experiencing poor visibility. BBC Weather's Simon King said there was a "brisk easterly wind" forecast for Wednesday with "little to no rain in the forecast for at least a week". The fire service said smoke levels in the air were not "toxic" but could be an "irritant", and advised people to close windows. Public Health England also advised people to wash their faces with soap and water and keep hydrated. Four schools in the Tameside area have been closed, the council said. The Wildlife Trust said the fire would also have "devastating consequences for some animals and birds". Director of conservation Tim Mitcham said: "Only the most mobile of animals escape and of course we are in peak breeding period for many. "The habitat will recover but it will take time." Do you live in the area? Have you been affected by the fire? If it's safe to share your experiences then please email haveyoursay@bbc.co.uk with your stories.